Alderleaf offers several outdoor education courses. Learn outdoor leadership and nature-based teaching skills. Choose from weekend classes and nine-month programs. Prepare for a career in wilderness education. Learn the skills needed to become a competent outdoor educator. 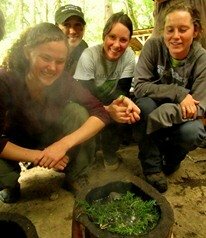 Nine-Month Alderleaf Wilderness Certification Program - Our most comprehensive course. In-depth training in survival, nature skills, outdoor leadership, and sustainability. The program prepares you to apply nature skills in a variety of outdoor careers in wilderness education, environmental research, sustainable living, and beyond. Imagine Knowing how to teach nature skills to others in a way that inspires hope, leadership, and action. Nine-Month Advanced Wilderness Skills Program - A second year of advanced training for Wilderness Certification Program graduates seeking to further develop their skills towards careers. The program focuses on advanced studies and applications of each of our core curriculum areas (survival, tracking, ethnobotany, permaculture, naturalist skills, and outdoor leadership & teaching). Wilderness First Aid Training Courses - Certification in the fundamental concepts of medical care in a wilderness setting. These classes focus on basic life support skills, minor trauma, spine assessment, selected environmental topics, toxic and allergic reactions, the ruling out process, and "common" medical emergencies. The majority of time is spent in hands-on skills practice and simulations. 5-Day Wilderness Skills Camp for Kids - Our summer day camp for youth ages 6 to 12 - is Alderleaf's program for youth. Now your children can also experience Alderleaf's amazing outdoor education! Kids learn the basics of wild edible plants, birding, wilderness survival, ecology, wildlife tracking, and more through exciting adventures, activities, crafts, and games. 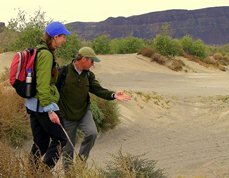 For more information on the field of outdoor education we recommend OutdoorEd.com.